First of all: THANK YOU for the great enthusiasm and feed back to the Virtual Quilting Bee. It’s been a crazy weekend, so I haven’t been able to respond to all the comments and questions. The main questions were about fabric requirements and availability for the quilt-along. I will have answers to both in this Friday’s post. Thank you! It’s been a while since I’ve done a gratuitous drool-worthy, fabric post. I’ve had some really pretty fabric show up in my mailbox over the past few weeks, most of it new collections, so I thought I would share some of the eye candy. Occasionally I get yardage from fabric companies to use in a new pattern or in exchange for contributing to a blog, etc. I will admit, I really like that. Because who wouldn’t like free fabric? But most of the time I still spend my own hard-earned cash when I see something I can’t live with out. This post contains some of both. 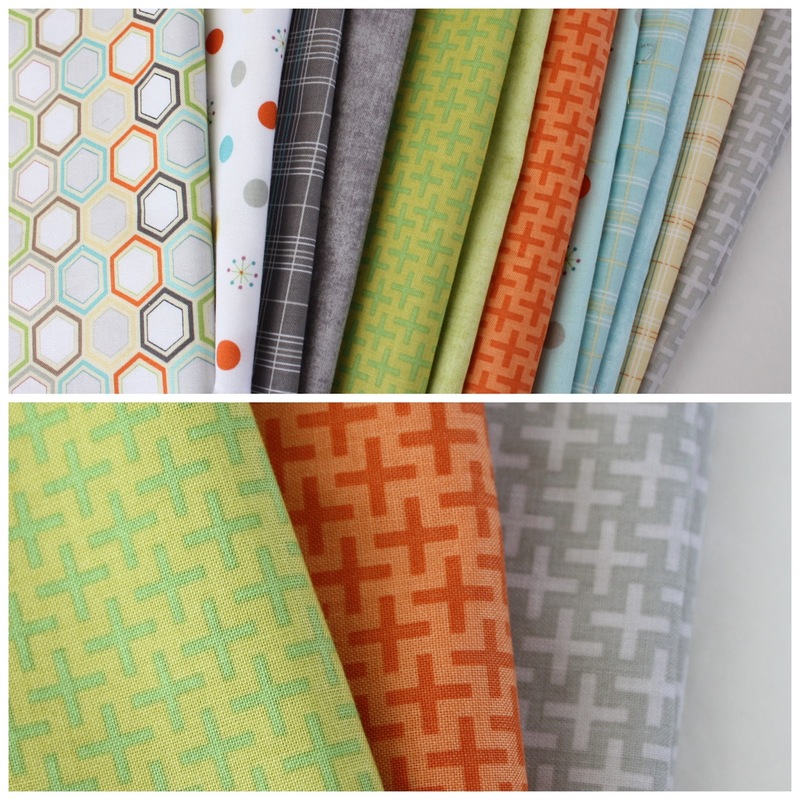 The top photo and the one directly above are fat quarter bundles from Art Gallery Fabrics. At the top is Sarah Watson’s new collection, Luxe in Bloom. SO pretty. I’ve been petting it and Saturday night I decided on the perfect project. I’ve been wanting to remake my Chain Linked pattern in grays, and I’m going to use this as the pop of color. I’m hoping to cut it up and take it with me to a sewing retreat in a couple of weeks. Luxe is available here and here. Another new spring collection is Carnaby Street by Pat Bravo also for Art Gallery Fabrics. Rich colors and “springy’ while still being fresh and edgy. I’m especially loving the navy. If I were at all decent at making myself clothing, I would love a top out of that mint and navy circle print (it’s called Retro Pop Mint). Love it. Carnaby Street will be available this month from Fat Quarter Shop and from Mad About Patchwork in Canada. 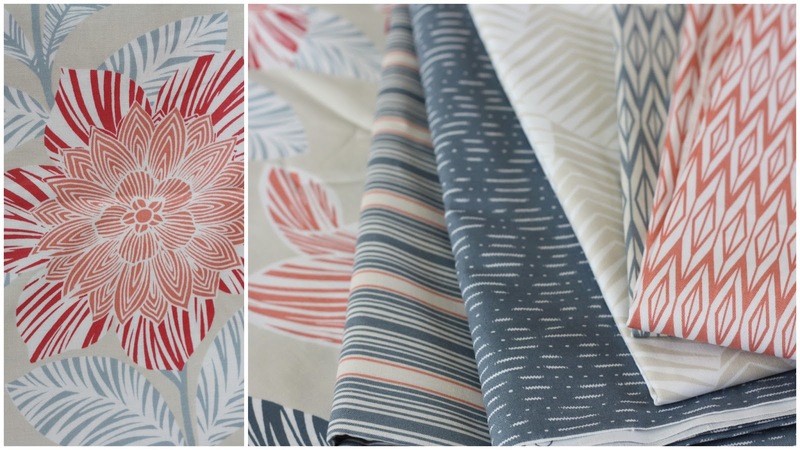 I’m also really crushing on some Dear Stella fabrics. I’m working on a project right now using Cleo (above) that I’ll share in the future. It’s a little more muted, but I like it – espeially the bargello prints and that big dahlia looking flower. You can find Cleo here and here. Dear Stella also has some great blender prints. I love this navy zigzag that I got from DryGoods Design. I also love the orange Piper Zig Zag print. Both are more blendable, subtle chevron design. Another upcoming Dear Stella line that I’m probably going to need is Va Bene – it’s an Italian themed collection with Vespas and tomatoes and monuments in Rome. I’ve got a few Italians in my life that I might need to do something for. It’s available here. I should probably get some before it’s gone! Speaking of chevrons, I’m loving this new version with a twist from Riley Blake: scallops! I put the spool on so you could see the scale. I got this little sample from Riley Blake for a project, but I’m going to definitely need to buy more. It also comes in aqua and royal blue and it’s in their new collection, Maritime Modern. It will be available soon from Poppy Seed fabrics and many other places I’m sure. Another recent Riley Blake collection I love is Life in the Jungle by Doohikey Designs. I’ve got some baby boy gifts planned with this bundle. It’s so perfect ‘boy’ without being cutesy. I especially love those “Tic Tac” crosses. Such a good modern blender. They are available here and from the Fabric Spot in Canada. Finally, a few more prints that called my name. Ever since our trip to Paris last fall, I’ve been a sucker for French inspired prints. 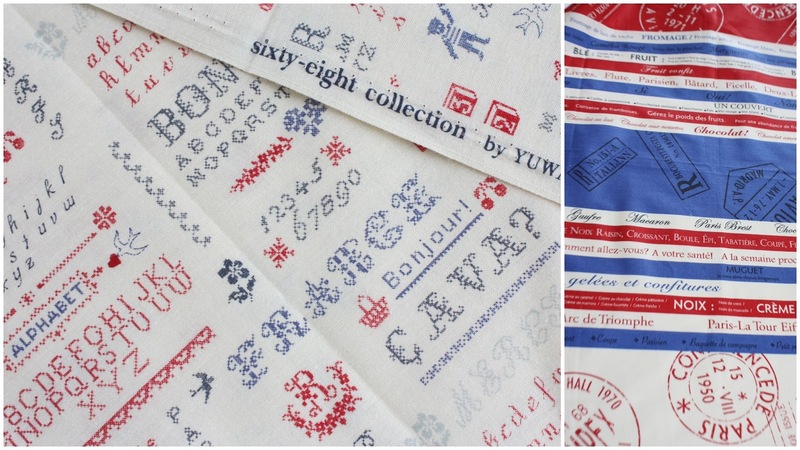 I think I need to make a France quilt now…so this new collection by Kei/Yuwa is calling my name. Finally, a little Fat Quarter of this French Yuwa print. (Isn’t it interesting that the cutest French prints are from Japan?) I got this one and the cute cross-stitch text print above from this awesome little Etsy shop. Their service was great! I may have also succumbed to some out of print pieces of Katie Jump Rope… Now it’s time to make something with this loot. These are absolutely beautiful! And I&#39;m already in love with this etsy shop. 🙂 I can&#39;t wait till Friday!!! Love the Riley Blake scallops and the Franco-Japanese prints! I&#39;m trying so hard not to buy fabric right now (I need to sew my way through some of my stash first) but you are seriously tempting me to smuggle more fabric into the house while my husband is at work! Thank goodness I sat down with a box of Kleenex because I was drooling big time as I was reading this post!! That&#39;s it, I&#39;m coming over to stalk your postman ;o) Not surprised about the Japanese French themed fabric though, the Japanese have a bit of a thing for Europe! What a treat on a dreary day!! So much better when you can see those lovelies 🙂 Thank you! 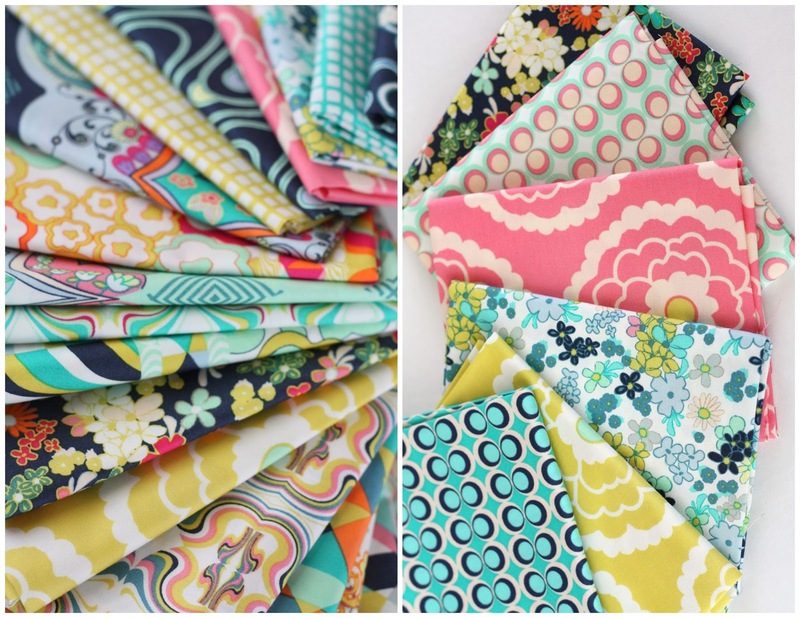 You always find the best fabrics — I don&#39;t even know where to start — I love so many of them! I&#39;m glad to know someone else &quot;pets&quot; their fabrics. ;)<br /><br />It is so nice to see these fabrics up close and (almost) personal – sometimes their photos look a little drab in online stores. I also love that you provide some details about their origination plus links for them! Who doesn&#39;t love pictures of pretty fabric? 🙂 Question for you: Would you say that the Cleo fabric is more on the orange, or red, side? I would love to make pillows for my couch out of the fabric in your picture that is all the way on the right, but it would definitely need to read as red. Also, those scallops by Riley Blake are genius! How is the wider issue actually significant? Here we go – another day, another garbled doctrinaire piece about Gratuitous Fabric. It&#39;s easy for people to comment, but I doubt if any or very very few are party to actual information, by doing so you comment out of sheer ignorance, hence many stated comments are just made out of pure opinionated witlessness with no relativity to facts. <a href="
That is one nice stack of new pretties to play with. Enjoy!